Walking down a greeting card aisle can elicit mixed feelings. There’s a ton of cards out there and choosing one can be overwhelming. Yet when you’re Muslim, it can be even more challenging to find a card that fits your situation. And don’t even get me started on the limited designs available for holidays like Ramadan and Eid. In order to address these greeting card dilemmas, a Muslim entrepreneur has just the solution. 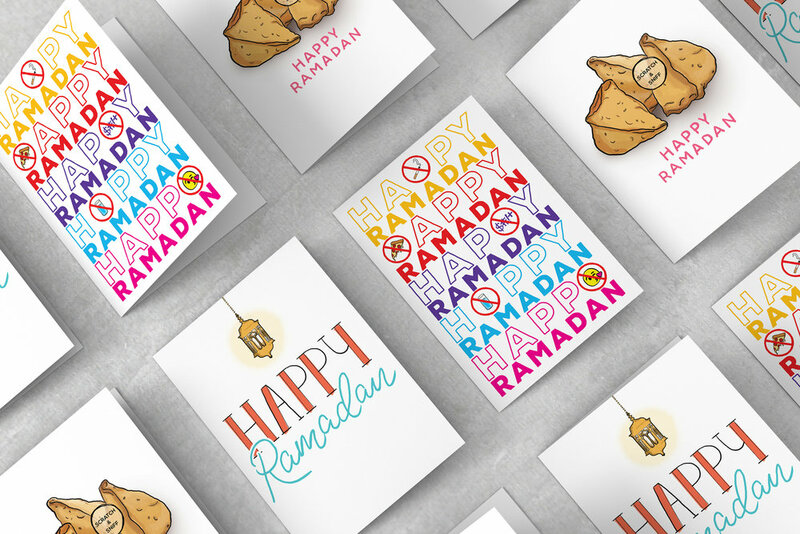 Meet Fadwa Abulughod, the graphic designer behind Halalmark, a greeting card company that specifically caters to Muslim experiences. MuslimGirl had a chance to talk to interview Fadwa to get an in-depth look on her exciting venture! Muslim Girl: Tell us a little bit about yourself! Fadwa Abulughod: My name is Fadwa Abulughod. I’m originally from the land of cheese, Milwaukee, WI. About two years ago I set out in search for something new and exciting and woke up in the city that never sleeps. I am a full-time designer at an advertising agency called imre and if I’m not designing there by day, I am constantly working on side projects (and Halalmark!) by night. I have been into art most of my life and I’m so happy to be doing what I love 24/7. I began creating cards for my friends on special occasions and that’s what really triggered the idea of Halalmark. It was just a fun hobby for me until I started realizing I could create a business out of it. Not all cards that I made were Muslim-centric but the ones I did create really resonated with me — and I thought, why not start making them for real? I didn’t see any out there like mine and I thought it would be a really cool idea. Who is your target audience? Is this brand only for Muslims? Although my audience is Muslims, that doesn’t mean non-Muslims alike wouldn’t appreciate the humor. As a graphic designer, do you believe it’s important for Muslims to branch out into fields like art? I think it’s important for Muslims to branch into many fields, art included. I believe everyone in some form or another is creative and it’s important to showcase that. A lot of people don’t realize how much art and design influences everything around us, and it’s important we start opening our eyes to that. Tell us more about Halalmark and what types of card categories you plan on creating. The reason I created Halalmark was because I realized there was nothing out there for Muslims to commemorate their special moments, big or small. Well-known commercial brands weren’t carrying any, and small brands weren’t really catering to the style I knew was missing. I wanted to create cards that people cared about sharing and could relate to and ones that would be memorable. Is there a card or design that is your favorite? Why? Aw, man. If I had to pick one, I would probably say the scratch and sniff Ramadan cards. 😉 Stay tuned! With the current political situation, do you feel as if your business is going to receive backlash from any non-Muslims/Muslims? No one ever really knows what’s to come when they first launch a business, but if you have a good sense of humor and can laugh at yourself (or others), I think you’ll enjoy what I bring forward. If I do receive backlash, I know I had good intentions and I’m sure God will forgive me. Honestly, it took me forever to launch, so this baby has been growing for a while. I have a lot of inspiration all around me, especially living in New York. I would say my cards are mostly humorous with a little bit of sincerity. You honestly have to have a good sense of humor to appreciate them, and that’s why I enjoy creating them so much. And of course, a lot of my crazy ideas wouldn’t have been possible without the support of my family, friends, (forced) focus groups and long train rides. What could we do to help improve your sales? BUY MY CARDS. Help a sista out. But in all seriousness, I just want people to enjoy Halalmark cards as much as I enjoy making them. What message or advice would you like to give to other aspiring Muslims? Just go for it and see what happens. We always have excuses, there will always be things in the way, or we wait for tomorrow to come. But sometimes you just have to realize what’s important and go for what will make you happy even if it’s risky or crazy or both. As Muslims we’re already marked with challenges and roadblocks and adding one more for ourselves is not okay. Now stop reading this and go go go! Follow Halalmark on Facebook and Instagram! Bibliophile. Anime fanatic. Kpop lover. Foodie. Fashion. Curiosities. Oddities. And the rest is just history.